If you don’t use the iPad carefully, it is going to slow down and you won’t be able to use it properly. To fix the slow performance or any other problem, you should reset the iPad to factory settings. But, there are many people who don’t have the access to the computer and cannot do the iPad Factory reset without iTunes software. Such people had to wait for the computer and then use the iTunes software to reset the iPad and then start using it. Instead of waiting or asking a friend for computer access, you should try learning how to reset iPad to Factory Settings without iTunes. Yes! there are multiple methods you can follow and reset the iPad device to the factory settings within a few minutes without using the iTunes software. If you don’t have the computer and want to Restore the iPad, this is the post you should read and follow the solutions. Many people don’t have the computer or laptop at their disposal. Some people have the computer but as they are traveling, there is no way to access the same. and while traveling, your iPad may encounter some errors and the only option you have is to reset the device to factory settings. In this post, we are sharing some working solutions, which will help you to reset iPad to Factory Settings without Mac device or the iTunes software. Follow these solutions and you are ready to roll with Device restored to factory settings. The Apple has included the Factory Reset option in the iPad itself. You don’t have to connect the iPad to your computer and reset it with the iTunes software. Just follow these steps and Reset the Device. First of all, unlock the iPad and open the “Settings” app from the app drawer. In the settings app, scroll down and tap on the “General” option. In the General Settings, find the “Reset” option and tap to open it. Now, you’ve to tap on the “Erase all Content and Settings” to start the reset process. Enter the passcode of your iPad if asked and you’re done. The process will take a few minutes to complete the process of reset to factory settings. If your iPad is locked up and you want to use the Hard Reset to restore the factory settings, then using the Buttons to hard reset is the best option. All you have to do is to hold the button combination for a few seconds and your iPhone will boot after resetting to the Factory Mode. Press and hold the Wake/Sleep Button on top of your smartphone and also the home button. You have to press and hold these two buttons simultaneously. Hold these buttons for more than 10-15 seconds until you see the Apple logo on the screen. After seeing the Apple logo on screen, Release the buttons and let the iPad reset itself to the factory settings. The process will take a few minutes to complete, so be patient. If you are using the older computers and don’t have the iTunes installed or cannot install due to compatibility issues, then you can use the third-party software programs. The Third-Party software to Reset iPad to Factory mode without iTunes is famous in the community. In this method, we are using the iMyPhone Umate Pro software for demonstration purpose, which is a cool iOS utility software. First of all, download and install the iMyPhone Umate Pro software from their official site. You can get the Premium version or use the Free version to reset your iPad. After installation, open the software and connect your iPad to the computer with the help of USB cable. 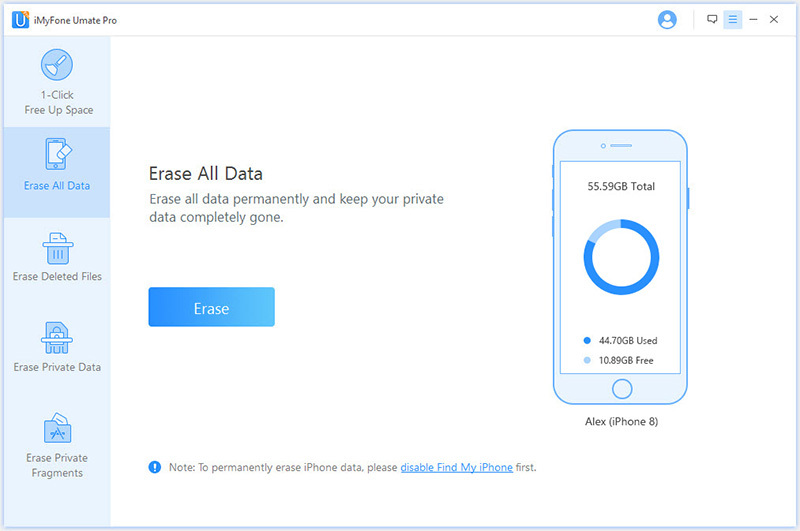 In the UMate pro software, click on the “Erase All Data” tab which is located on the left side. 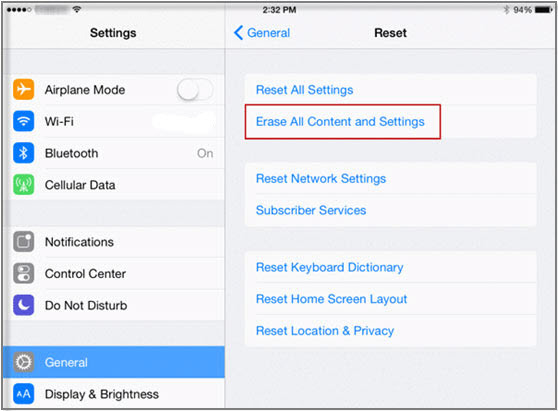 Now, click on the “Erase” button to delete all the data stored in your iPad and reset it to the Factory settings. The process will take a few minutes so be patient. There is no complicated process to Reset iPad without iTunes. If you don’t have the access to a working computer or don’t want to install the iTunes, then you can follow the methods mentioned in this post. I hope you learned how to reset iPad to factory settings without iTunes. Just follow any of the mentioned methods and you’ll successfully reset the device to factory mode. If you face any problem or doubt while trying these solutions, please make sure to comment below so we can help you.